This condo in Centerville is the ultimate home base for your next Cape escape! With 2 bedrooms, 1 bathroom, and an updated interior, this vacation rental is perfect for groups of up to 5. This condo offers all of the modern amenities to keep everyone comfortable and entertained including complimentary linens, an outdoor shower, 40” flat-screen TV, and wireless internet access. Enjoy the white sand and surf as well as beautiful sunsets on Craigville Beach, just 300 feet away! Built in 1950, this condo has aged nicely and features a unique character. The gray cedar shake exterior, light window panels, white accents, and outdoor shower give the home a charming traditional Cape Cod look. You'll also love the condo's interior, featuring beautiful wood-toned floors, soothing colors, and comfortable furniture. Unwind and watch some TV during downtime or use the free WiFi to surf the net! Another great exterior quality is its expansive front yard and private backyard, both of which are perfect for stargazing on a warm summer night. After a long day at the beach, look forward to cooking in the open kitchen, fully equipped with everything you need to create delicious meals. Or, bring home some of the world famous Massachusetts seafood, whether it is cod, lobster, halibut, or mussels, from nearby restaurants ranging from beachside clam shacks to more sophisticated dining. You simply can't beat this condo's location! From here, you'll be just seconds from a private access path to Craigville Beach. Spend days relaxing in the sun with the provided beach chairs and towels. For sports enthusiasts, the Tom Brady Best Buddy Challenge and Hyannis Sprint I Triathlon events finish nearby at the beach. Great dining, shopping, golf, and world-class entertainment await at the Cape Cod Melody Tent in downtown Hyannis. Additionally, the ferries to Nantucket and Martha's Vineyard depart from Hyannis. Homemade ice cream at Four Seas and comfort food at Craigville Pizza are a short half-mile walk. Lake Elizabeth and the famous Craigville Retreat Center with its stunning views also provide the opportunity for a scenic evening stroll or morning jog if you tire of the beach. No matter your interests or the time of year, this handsome Centerville vacation rental condo will provide a perfect home base for a memorable vacation. - Amenities include a fully equipped kitchen, outdoor shower, free WiFi, complimentary linens and towels, 44” flat screen TV, Netflix, and much more! Amazing location just 5 mins walk to beach! The place is a duplex so it is cozy. 2 bds (onr king, one with a queen and 2 singles). If you don't mind sharing a bathroom this is perfect for 2.couples or a family. My favorite was the outside shower. Nothing beats showering with the breeze and sun around you 😀. The owners are very accessable if you have questions and are very nice. 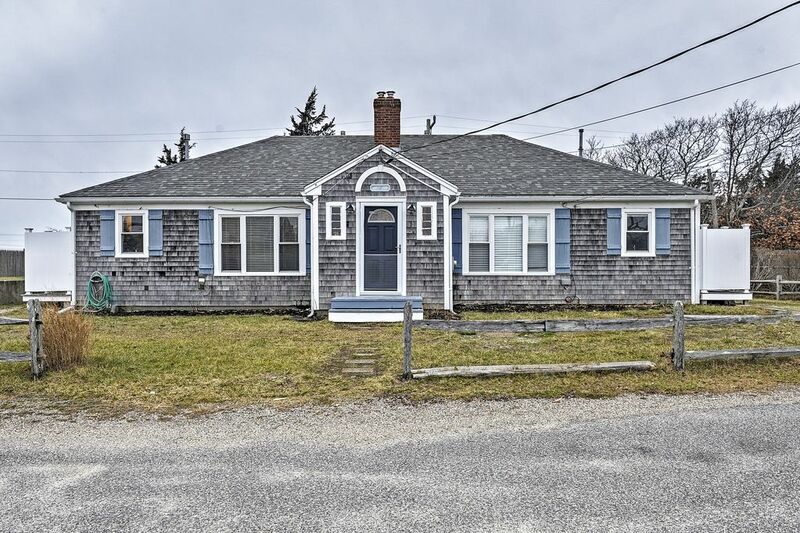 Very close.to Hyannis (5-10) min drive so there is lots of options for food and shopping. There is a great restaurant which has pizza, Mexican and American bar food within walking distance. Loved our stay. Hope to return in the near future! Beach vacation with it all! We were hoping for a beautiful beach vacation for our family and were not disappointed! Steps from the beach, we were close enough that we could walk without tiring while carrying all of our beach gear (only a few houses away!! ), but far enough that the beach traffic was not an issue! It was a busy week, with lots of beach-goers but we never had to worry about parking, because we were there already :) and we always had plenty of space at the private beach access just off of Craigsville Beach. The house had everything you could ask for, plenty of linens and a fairly stocked pantry (just in case); stocked kitchen and living spaces made it feel like home. There was a glitch with the Wi-Fi while we were staying (Xfinity/Comcast), but this was a nationwide issue completely out of the landlord's control. Moy (our Landlord) remained diligent and did her best to keep us apprised of any changes in her efforts to get the house back online. There wasn't anything that could be done, but it was outstanding to know that she cared and was doing her best to get the issue remedied. We would stay at this home again, and highly recommend the landlord!!!!! Amazing service, awesome vacation! Thanks Moy! perfect location close to the beach, great for groups! I was with a group of 5 girlfriends staying here over a long weekend - it was the perfect location to relax, walk to the beach, and stroll around. We cooked breakfast in the kitchen (plenty of dishes and pots/pans) and we enjoyed the living area in the evenings. Everything was clean and comfortable. One of the days Moy and her husband were outside doing some yardwork but we were gone most of that day. The check-in and out process was very easy. We had a great stay and would definitely come again! My family and I had a wonderful time staying here. It was a quick walk (across the street) from the beach in a quiet neighborhood. Everything was very clean and what you'd expect from a nice little cape house. The home owner was great and gave us plenty of tips of things to do in the area. The beds were not at all comfortable, so it may be good to pack a spare air mattress -- but for the location, it was definitely worth the stay!